My pal Jenny and some of her friends are Seattle thrift-sale regulars, and they found this 1986 earrings catalog which simply has to be seen to be believed. I love their comments, and most of all, I love the photos. Confession: I had (may still have...) several pairs of earrings that, if not identical, were awfully darn similar to these. Come on! Some of you did too, right? The plastic shapes in rainbow colors? The dangling hearts? The whatever those things are that look like two U shapes stuck together at an angle? The plaid shapes that remind me of when Scottie dogs and tartans were super popular? The dangly fake plastic feather shapes that remind me of those feathered roach clips they sold at the State Fair and pretended were hair clips? Until I was 22, I do not think I owned a single pair of earrings that was not bought of the "3 pair for Whatever" rack at Claire's Boutique in the mall. Clas-say. I had those catalogs!!! 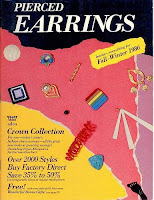 I didn't buy a lot of earrings, so I don't know why I has the catalogs. You paid for earrings at Claire's? We just shoplifted them. OMG! we had one of these catalogs. I LOVED that thing. Never convinced my parents to buy me anything from it- but I dared to dream. I had the dangly, multi colored hearts and the necklace to match. I wore them with a rainbow striped sun dress. I love that catalog so much, I kind of want to marry it.